It has been a busy year for Manchester District Music Archive. We became a charity at the back end of 2015 and worked hard all year to earn that title. In January we celebrated Women in Manchester Music at the wonderful Digital Women's Archive North event at HOME. We held the Bob Dylan 'Judas' anniversary gig at Academy 3 in June, raising £2400. Thanks to all who came, and to our co-chair CP Lee, who fronted the whole shebang amazingly. CP's book about that fabled night in 1966 is now out on Kindle. We curated Manchester Academy Memories, an online exhibition documenting the history of live music at the University of Manchester from 1963 onwards. It's packed with inspiring fans' stories, featuring Captain Beefheart, Patti Smith, David Bowie, PJ Harvey, Jimi Hendrix, Prince and many more. Our curator, Abigail Ward, did 'In Conversation' events with Brix Smith-Start (The Fall) and Jon Savage (on rave and Madchester). 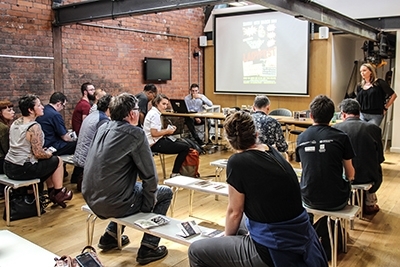 We held two workshops at the People's History Museum: Activist/Archivist in June and the opening event of the National Archives' Discovering Collections, Discovering Communities conference in October. We spoke about MDMarchive at Superbia, Manchester Histories Festival, Queer Media Festival, Louder Than Words Festival, the Manchester is Here Symposium at MMU and International Women's Day16 at HOME. Abigail gave her Queer Noise talk about LGBT+ music and club life in Manchester at Band on the Wall in June, and then again in the old Cinema 3 in the Cornerhouse building (now MMU) over Pride weekend. We went live with MDMarchive's DONATE button in September. If you enjoy browsing our archive and believe in what we do, please consider throwing a few quid our way. We've ended the year with a funding application to Heritage Lottery Fund. We're hoping to do a community outreach project called REBEL MUSIC, which includes plans for two physical exhibitions on women's histories and LGBT+ club culture respectively, the latter at the People's History Museum. We also plan to update our website, making it fully device responsive. Please keep everything crossed. We need your good vibes. We'll hear back in February. Here's our full year in review. Thanks for all your support. We've got big plans for 2017, so watch this space. 2016 has been a vintage year for uploads. Thanks to everyone who has made a contribution. Our archive can only survive if people continue to share their memories and artefacts. You can get help with uploading here.